Easy construction using 1’ x 6’ pre-glued panels. Provides compact storage in a tiny space. Features adjustable shelves in the upper and lower section. Rotates on a 12” Lazy Susan to expose the full-length mirror on the back. Optional coat hooks can be added to each side. Measures 73”H. Round base is 19” dia. Order hardware package and optional coat hooks separately below. Swivel Cabinet Hardware includes a Lazy Susan bearing with mounting screws, magnetic catch, non-mortise hinges, brass knob, and 16 shelf supports. 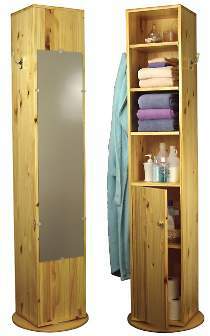 Project plan, coat hooks, mirror, wood and wood finish are not included.